A scene from the Steampunk Haunted House. Mechanical monstrosities! 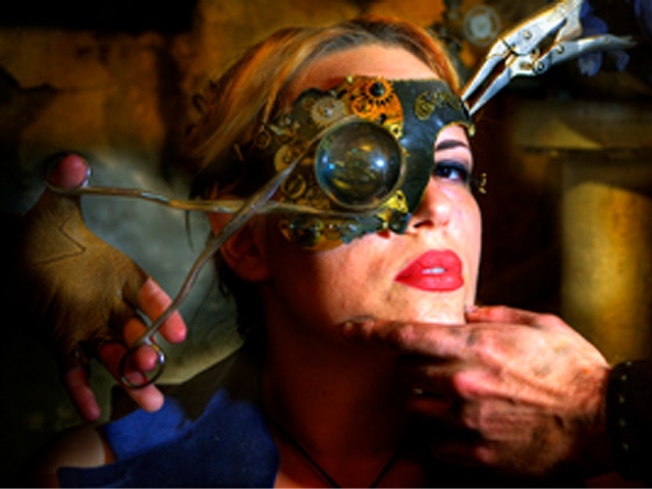 Steam-powered cyborgs! And, as the event’s disclaimer reads, “fog effects, loud noises, lots of dust, soot, dripping pipes, churning gears, rusty metal, and other things that will hurt you if you touch them”! That’s what you’re in for at the Steampunk Haunted House, which takes over the Abrons’ century-old Playhouse tonight through Saturday night only. The event, created by the Bessie-Award-winning Third Rail Projects, offers a completely different experience from the standard moaning-zombie fare you get at most haunted-house-type endeavors. It’s a little Cabinet of Dr. Caligari, a little Mad Max, and a little Brazil, especially that scene where Katherine Helmond undergoes a plastic surgery procedure that makes you almost lose your lunch. How many Halloween events can claim Kafka among their inspirations?